For many months I struggled to fit an easel into my day home space. I really wanted one. Maybe even two! But I just couldn’t figure it out…I had no more available space! And then the weather got warm and I got smart. I put two easels outside on my patio! Perfect! It was so very important to me that I have easels for the smalls. I really, really wanted them to have a space where they could go and paint whenever the mood struck them. Why couldn’t I just let them paint at the table? Why is the easel so important? Well, I’ll tell you! First of all, it is the perfect height for toddlers and preschoolers… There is no reaching to dip paintbrushes, which means there is no tipping over of paint pots! This is a good thing. Secondly, there is no last-minute set-up involved when a child wants to paint. The paint is already there, the smocks hang close by, and the paper is clipped to the easel beforehand. 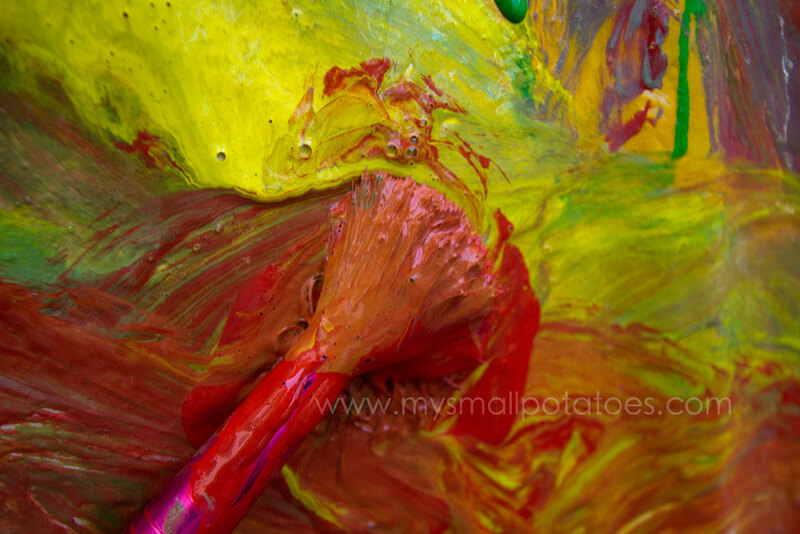 But these conveniences aside, the importance of painting in a small child’s day is the key. The easel is just a simpler vehicle for allowing your child this opportunity. So many skills can be discovered and practiced while painting. I have chosen five to focus on today. The first one is EYE-HAND COORDINATION… Dipping the paintbrush in and out of the paint pot requires a steady hand, and a keen eye working simultaneously. 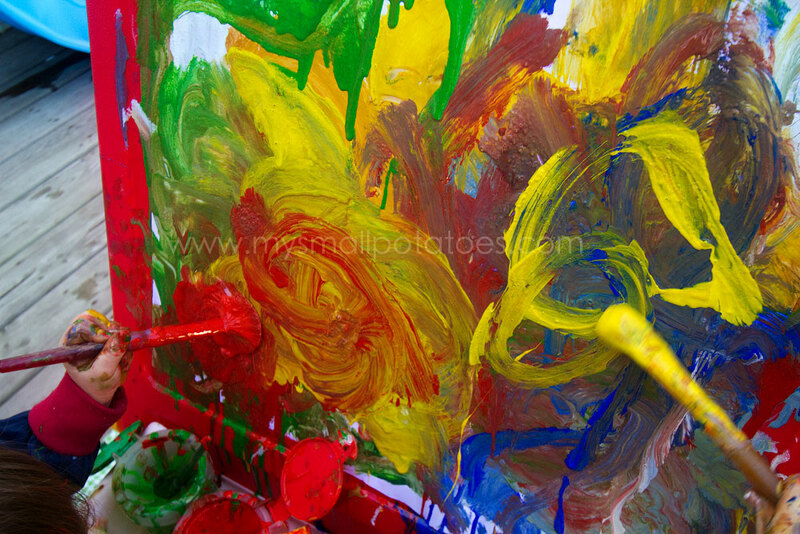 This is excellent practice for toddlers, as the paint pots are held firmly in the easel pockets, keeping frustration to a minimum. Without the threat of tipping, the pots are easier to navigate! 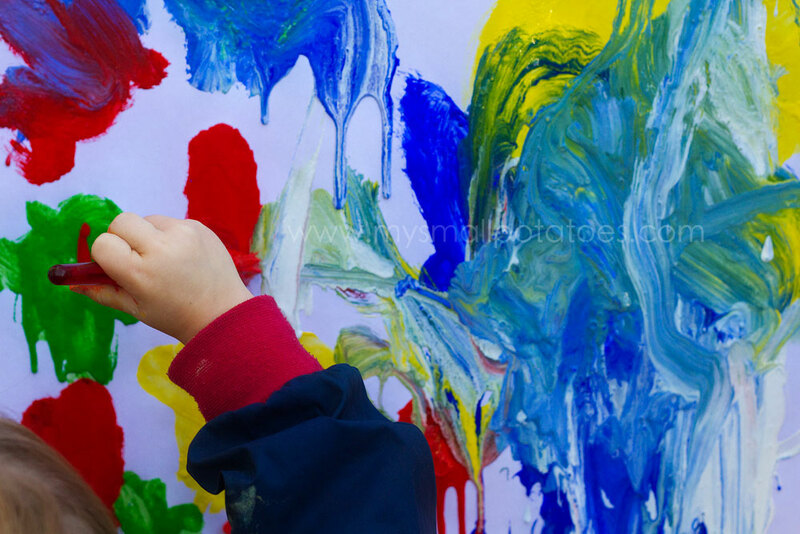 The second skill your child will practice at the easel is SMALL MOTOR CONTROL… Holding the paintbrush itself and whooshing it across the paper in the direction you want it to go, is hard work when you’re small. Think of all the pre-writing skills they are learning just by holding the brush! Also, dipping into pots hones the small motor control muscles. The third skill is COLOUR MIXING… By having free reign of more than one paint colour, the small child learns that by mixing two or more colours together , she can create a new one! It’s like magic, but it is also the beginning of learning colour theory. 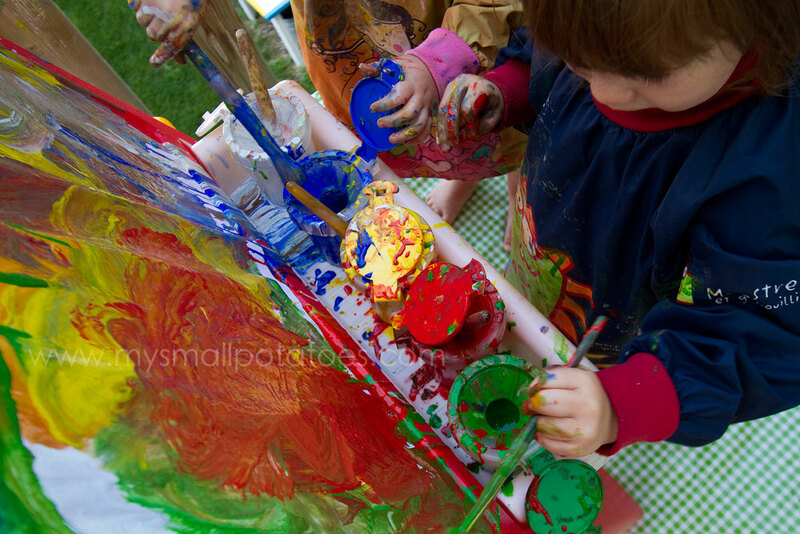 The fourth skill a child can learn at the easel, is SHARING and COOPERATION… When you double up the smalls at the easel, they can create together. They learn to wait their turn for the red brush, or the yellow, etc. They learn not to grab from one another. They learn it’s not ok to paint on one another. They also learn that sometimes it is more fun to work together with a friend. Such important skills for smalls. By separating toddlers into individual activities all the time, we fail to provide opportunities for them to learn to share and cooperate with their peers. The fifth skill, is CREATIVE INDEPENDENCE… ( my personal number one reason for an easel) There are no rules when it comes to painting. There is no determined product. Just a process. The child can plan her own painting, from start to finish without any interference from adult rules or directions. The only thing she must remember, is to paint only on her paper. In my opinion, this is the best kind of art. The kind with no rules. The kind where children can create as they please. 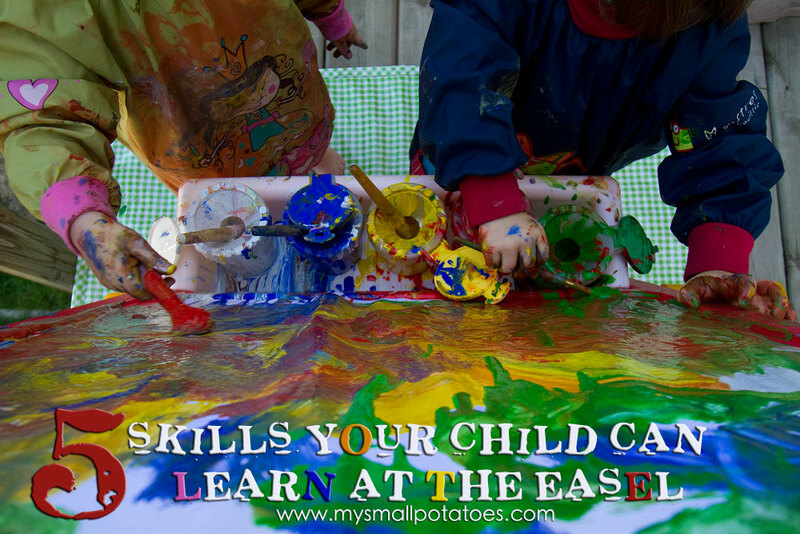 By using the easel, you have created a space where the child can be creatively independent. Now you will truly start to see the creative little spirit that lives within your child. This is a good thing. A very good thing. ❤ it!!! How do you help the kiddos clean up if this is done inside? *mat!! No may! Stinkin’ autocorrect on my iPhone! Lol! 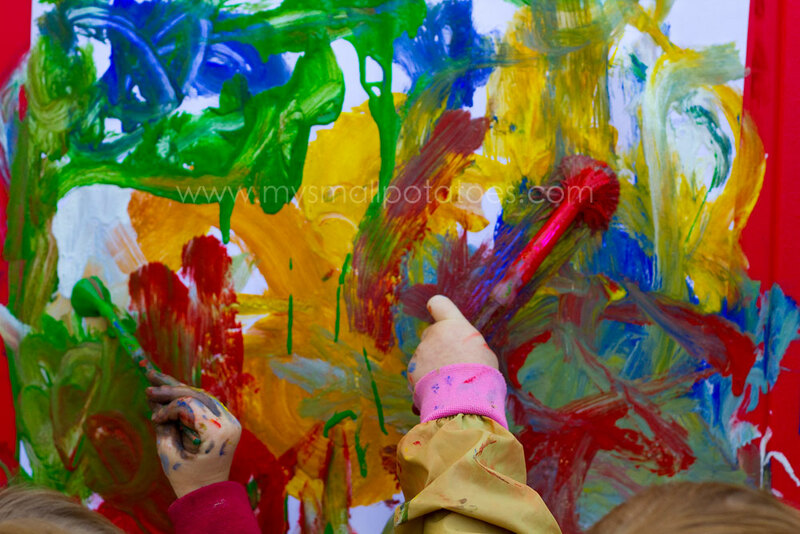 I love paint covered little fingers…it gives me goosebumps! Great post Arlee. I would love a dedicated art area where my kiddos could paint and craft whenever they liked! I do have our easel inside where it is currently being used as a whiteboard and blackboard, however it’s near the lounge so no good for painting on whenever the kiddos fancy. This post reminded me that it’s time it got used again for painting! We’re having awful spring weather here (more like winter with hail and storms) so too cold and wet to be outside. You’ve inspired me to move it to the kitchen/dining area, pull out the plastic tablecloth and put it on the floor for craft day Friday!! They also get important practice in crossing their midline which is necessary for brain development. We found an easel at a yard sale for $5 this summer and have loved having it on our deck. I love that my 22 month old can paint and I don’t have to worry about the mess. So great!! I’m still trying to figure out where I can keep the easel inside my house over the winter!! !